Israel’s legislative body, the Knesset, passed a law Wednesday aimed at drafting Haredim (also called ultra-Orthodox Jews by many media outlets) into the military. The ultra-Orthodox appear to be growing as a share of the Israeli population: The Myers-JDC-Brookdale Institute, for instance, projects that the percentage of Israelis who identify as ultra-Orthodox will increase from 11% to 18% between 2011 and 2030. Against this backdrop, there have been calls from less observant Jews for Haredim to be more “incorporated into [the] economy,” as one Israeli politician put it. In addition to avoiding military service due to a longtime exemption for religious Jews studying Torah, many Haredi Israelis are not part of the workforce. While the measure passed by a 67-1 vote, it’s anything but universally popular; 52 opposition lawmakers were absent in protest, according to the Associated Press, and ultra-Orthodox Jews have demonstrated against the bill in large numbers in both New York and Jerusalem. In the United States, it’s difficult to say exactly how much or whether the ultra-Orthodox Jewish population is growing, but American Orthodox Jews overall tend to have more children than other Jews. For U.S. 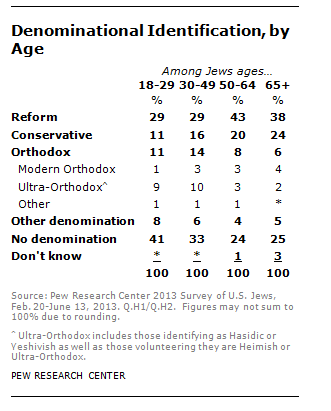 Orthodox Jews, there have been 4.1 children born per adult ages 40-59 (compared with 1.9 for Jews overall), according to a 2013 Pew Research survey of Jewish Americans. Our survey found that ultra-Orthodox Jews form about 6% of the U.S. Jewish population, and the group tends to be more insular than other Jews. Nearly all Haredim (97%) say that all or most of their close friends are Jewish; just 32% of Jews overall (and 65% of Modern Orthodox Jews) say this. Ultra-Orthodox Jews also almost universally (95%) consider their communities excellent or good places to live. Three-quarters of U.S. Haredim have been to Israel, but the group is less supportive of Israel than Modern Orthodox Jews are by some measures. For example, 64% of Modern Orthodox Jews say the U.S. is not supportive enough of Israel, compared with 48% of the ultra-Orthodox. And while 79% of Modern Orthodox Jews say that caring about Israel is an essential part of being Jewish, 45% of Haredim say the same. These differences date back to the founding of the modern state of Israel, which was opposed by certain ultra-Orthodox groups.